Less remembered is the fact that Gluck knew the enemy’s camp from within. Indeed, before he took on the conventions of what is known as opera seria, he played by their rules. Nowadays, while most opera fans are familiar with later scores such as “Orfeo,” “Alceste,” and “Iphigénie en Tauride,” Gluck’s early forays into the genre of opera seria remain little known, thanks in no small part to the very success of his own ideas for reform. Enter Odyssey Opera, which this month is laboring to remind us that Gluck was still Gluck before he became “Gluck” — that is, that the early scores are still the work of an undisputed master and very much worth hearing. Exhibit A is “Ezio,” written by Gluck for the Prague Carnival Season of 1750. On Friday night at Boston University Theatre, Odyssey opened its two-part opera seria mini-festival with a vibrant and involving performance of this rarely spotted score. 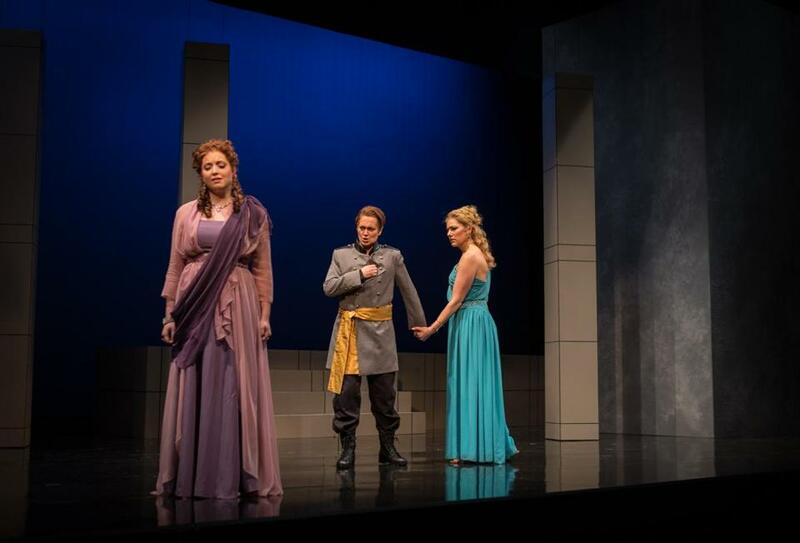 Set in fifth-century Rome, the work’s libretto by Metastasio (a libretto also set by several other composers including Handel) spins an ornate tale rife with political and romantic intrigue, slights of honor, and conflicting loyalties with more layers than a sfogliatella. At its center is Ezio, a loyal Roman general returned from battle yet falsely framed in a plot on the life of the Emperor, Valentiniano. Both men also love the same woman, Fulvia, whose father, a patrician named Massimo, schemes against the Emperor. After inching forward at a stately pace, the plot wraps up quite neatly in the end, and with charmingly period alacrity. As for Gluck’s score, it’s wonderfully colorful and imaginative from the first bar, and the composer seems intent on ringing every ounce of pathos from the libretto. Through the range of arias conceived for each of the principal characters, Gluck also suggests broader than expected dimensions to their interior worlds. The vengeful and raging Massimo, for instance, is given one of the most tenderly voiced arias of the opera: “Se povero il ruscello,” with plangent oboes ringing out over sweetly murmuring strings. Odyssey is taking its advocacy mandate seriously with an admirable, stripped-down production by Joshua Major. The staging seems to keep its ear attuned to the sincerity at the heart of this score and to trust the music enough to avoid encumbering it with facile or pandering conceits. Jennifer Holloway won well-deserved cheers on Friday night for her technically assured and deeply felt singing as Fulvia. Brenda Patterson was charismatically earnest in the title role, and Randall Scotting’s Valentiniano was, despite a few rough patches, a deftly drawn portrait of imperial hauteur. William Hite’s singing as Massimo showed both subtlety and a crystalline articulation of character. Erica Petrocelli (a master’s student at New England Conservatory) and Jesse Darden, sang solidly in the smaller roles of Onoria and Varo, respectively. And in the pit Gil Rose drew lively and handsomely detailed playing from the Odyssey Opera Orchestra. The mini-festival continues with Mozart’s “Lucio Silla” (June 8-12). Hear these operas while you can. They won’t be back anytime soon.